You, Too, Can Understand Geometry - Just Ask Dr. Math! Have you started studying geometry in math class? Do you get totally lost trying to find the perimeter of a rectangle or the circumference of a circle? Don't worry. Grasping the basics of geometry doesn't have to be as scary as it sounds. Dr. Math-the popular online math resource-is here to help! Students just like you have been turning to Dr. Math for years asking questions about math problems, and the math doctors at The Math Forum have helped them find the answers with lots of clear explanations and helpful hints. Now, with Dr. 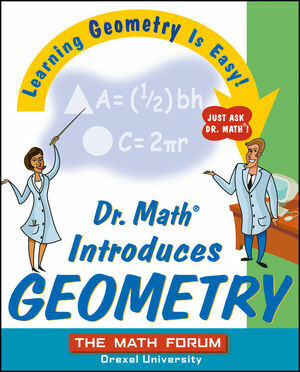 Math Introduces Geometry, you'll learn just what it takes to succeed in this subject. You'll find the answers to dozens of real questions from students who needed help understanding the basic concepts of geometry, from lines, rays, and angles to measuring three-dimensional objects and applying geometry in the real world. Pretty soon, everything from recognizing types of quadrilaterals to finding surface area to counting lines of symmetry will make sense. Plus, you'll get plenty of tips for working with tricky problems submitted by other kids who are just as confused as you are. You won't find a better introduction to the world and language of geometry anywhere! THE MATH FORUM @ Drexel (www.mathforum.org) is an award-winning Web site and one of the most popular online math resources for students and teachers. The Math Forum offers answers to all kinds of math questions, prepared by a team of math experts. It also keeps archives of previous questions and answers, hosts online communities, and posts several "problems of the week." PART 1: INTRODUCTION TO TWO-DIMENSIONAL (2-D) GEOMETRIC FIGURES. PART 2: AREAS AND PERIMETERS OF TWO-DIMENSIONAL (2-D) GEOMETRIC FIGURES. 3. Area and Perimeters of Parallelograms and Trapezoids. PART 3: CIRCLES AND PI. 1. Pi, Circle Parts, and Circle Measurements. PART 4: INTRODUCTION TO THREE-DIMENSIONAL (3-D) GEOMETRIC FIGURES. 1. Rigid Motions: Rotation, Reflection, Translation, Glide Reflection.